Corythosaurus was a pretty common find by dinosaur diggers. The dinosaur even had a few spots of fame in the film Jurassic Park , which was unfortunately more entertainment than real facts. 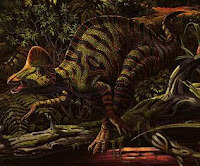 The first Corythosaurus to be discovered was in 1912 by a man named Barnum Brown in Red Deer River, Alberta, Canada . It was a really amazing find also, because it had not completely fossilized and there was skin and the dinosaur was close to complete. Many finds are only partial skeletons, and not the whole thing. This first ever Corythosaurus that was found is not around today in a museum because in 1916 it was transported to Britain and the ship was sunk by the German surface raider SMS Moewe. Today is lays at the bottom of the North Atlantic. Later on in 1975, Peter Dodson, a scientist studied several skulls of the many Corythosaurus found and concluded that the adult max. size, weight, and even bone structure depended on the gender. The Corythosaurus have been found in Montana, USA, and Alberta, Canada. They were herbivores and like other hadrosours (the group it's in) it had a toothless beak, and hundreds of interlocking teeth at the back of its jaw. The adult Corythosaurus is estimated at the weight of 5 tons Maximum. They have been over 25 skulls found and each one has a distinctive tall, strong, bony crest at the top of its head. The crest had the elongate nasal passages and the extended into the frill. Since Corythosaurus probably lived in herds this would allow unique sounds to communicate with each other and warn loudly for danger. On its feet it had deflated padding, NOT WEBBED FEET. Before 1975 people assumed that the Corythosaurus had lived near water because foot fossils showed what they called webbed-feet, but this isn't true. They have feet that were like modern mammals, but many findings were very far on land which had not been near water.